Calculate how many words you write per minute: Use a free words-per-minute checker such as Typing Speed Test. Keeping in mind that you will also need to pause from time to time to think what happens next, halve your word count per minute. If you can type as fast as 60 wpm, take 30 as your base rate. Work out how many words you write per hour: If you can write 30 per minute, you can write approximately 1800 words per hour (assuming you don’t stop to edit or rest). Factor in resting time for a more conservative estimate (e.g. 1000 words). 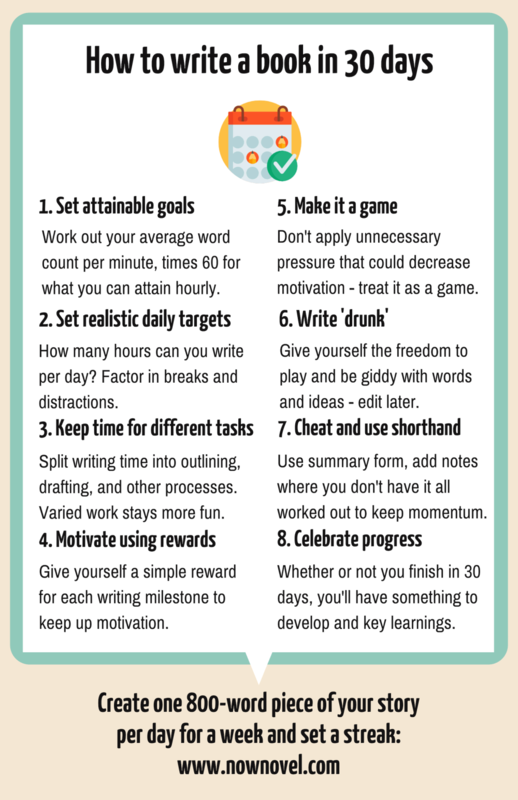 Work out how many hours you will have to write each day on average over the next 30. If you write 1000 words of draft per hour on a good day, an 80, 000 word novel should take 80 hours of writing to complete. Eighty hours of writing over 30 days would mean spending an average of 2.6 hours of writing per day. This is a lot when you have other commitments. Based on the amount of time you have available to write each day, adjust the length of your first draft until you have a word count you can achieve. You can always expand during subsequent drafts. Or write your first draft as a brief, novella version. If this seems like an impossible task, give yourself more days. Or write some scenes in summary form. You can add connective tissue between plot events (such as scene transitions) later. You might say to yourself ‘I can write for an hour each day, easily.’ The truth is that surprises, last minute obligations and life in general can hijack your writing time. For every hour of free time you have, bank on getting half an hour of that to write. Once you know exactly which hours you have free, block them out in a calendar. Use a colour that separates them clearly from other events and obligations. Draw an ‘X’ through each day once you’ve reached your word target. The satisfaction of this action (the sense of completion) will keep you motivated to continue. When seeing if you can learn how to write a book in 30 days, being structured is key. Divide each writing session into different tasks. Complete different sections of outlining or drafting simultaneously. This keeps the process varied and diminishes chances of getting stuck. If, for example, you prefer writing dialogue to introducing scenes and settings, leave your favourite part of the storytelling process for the end of each session. This makes your favourite part a reward that you work towards every time you sit down to write. Rewards don’t have to be expensive, overly indulgent or distracting. Take a walk somewhere inspiring or beautiful, read a few pages from a favourite book or grab a coffee with a close friend. Make your rewards relaxing activities that will help you return to the track renewed and focused. If you’ve ever watched competitive reality TV, you might have seen cases where the most competitive and committed participant cracked early under pressure. Placing too much pressure on yourself is a fast track to burnout. The quote ‘Write drunk; edit sober’ is often attributed to Ernest Hemingway, though it’s not clear whether Hemingway actually said this. Regardless of who said it, the quote does say something true about writing. It’s not that you should write drunk literally. But you should give yourself the freedom to write with that same uncontrolled giddiness. Before you get to editing. A big part of how to write a novel in 30 days is letting go of complete control. Let the sober editor in you control when the time comes for that. The writing part should involve as little critical interference as possible, if you want to draft fast. Make the font colour of your word processor match the background. Only highlight and change the font colour back when you reach your target word count. This will prevent you from focusing too much on what you’ve just said as you can’t edit until you reach a point of pause. Give yourself licence to be bad. Write terribly. Use clichés at every turn. Do this with the understanding that once you have the full draft and you’ve met your targets, you can go through and fix whatever you like. Leap in anywhere: Just because your novel tells a linear story doesn’t mean you have to be linear in your approach. If you’ve written the start of a scene, skip to the ending if you have an idea where it will go. Put in simple notes for whatever you’ll add later. 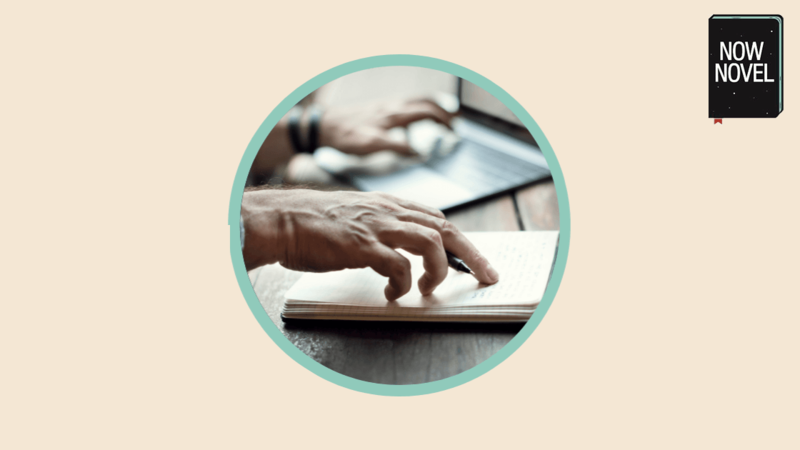 What people don’t always tell you when you ask how to write a novel in 30 days is that the most important part of this challenge is committing to it and trying. Determination and dedication will help you make progress. If, by the end of the 30 days, you don’t have a continuous, polished first draft, congratulate yourself for the progress you have made. You have a sturdy skeleton for a book you can turn into a better read. 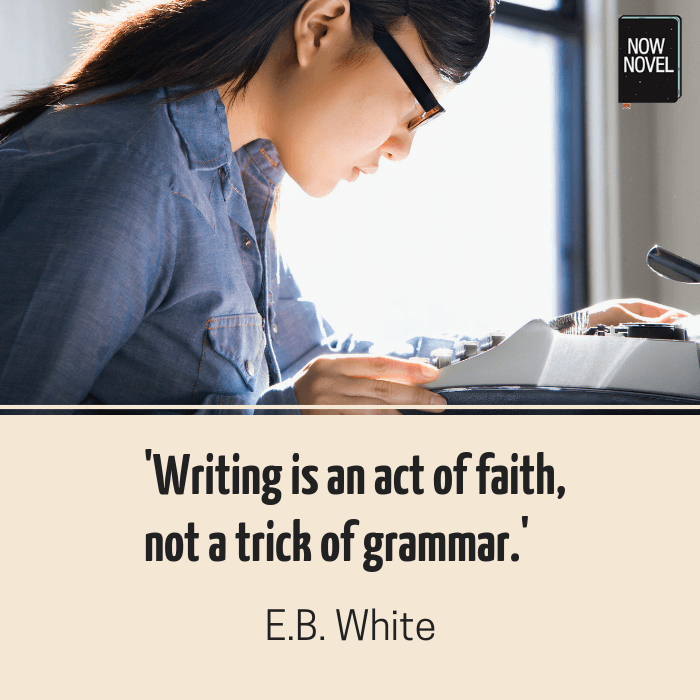 If you’re doing NaNoWriMo or simply trying to get through your draft, try to write an 800 word extract every day for a week in the note-keeping section on Now Novel. That’s 5600 words further if you succeed.